Everyone is turning health conscious these days and focus on eating nutritious food items. Dry fruits are known to be rich in minerals and other nutrients. They are healthy snacks which you can eat year-round. 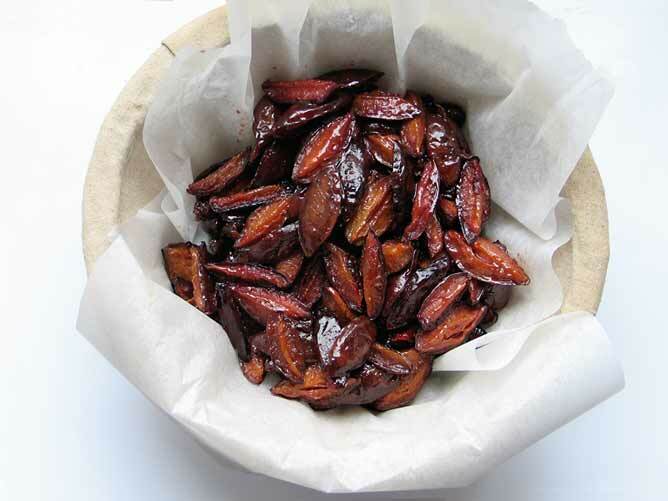 It would be more enjoyable and money saving if you prepare dry fruits conveniently at your home. 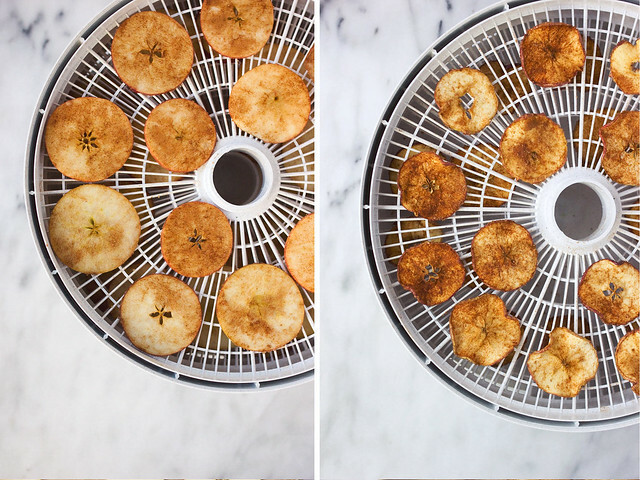 Here is the complete information on how to make dry fruits in your oven? You can select fruits such as bananas, apples, mangoes, plums, pears, cranberries, oranges and persimmons for this purpose. Whichever fruit you may select, pick the ripe ones and wash them well before proceeding further. Next, you need to remove stones, pits, stems and blemishes from the fruits. Some fruits, such as apples, taste better after the skin has been removed. So, it’s up to you whether you wish to peel the skin of the fruits or not. Last step in the preparation is to cut or slice the fruits into even parts. Preheat your oven to 130 to 160 degrees Fahrenheit. In case of thin sliced fruits, go for a lower temperature while whole fruits will need higher temperature. Next, you need to place a parchment paper in pans and arrange fruits in a single layer. Keep gap between pieces. 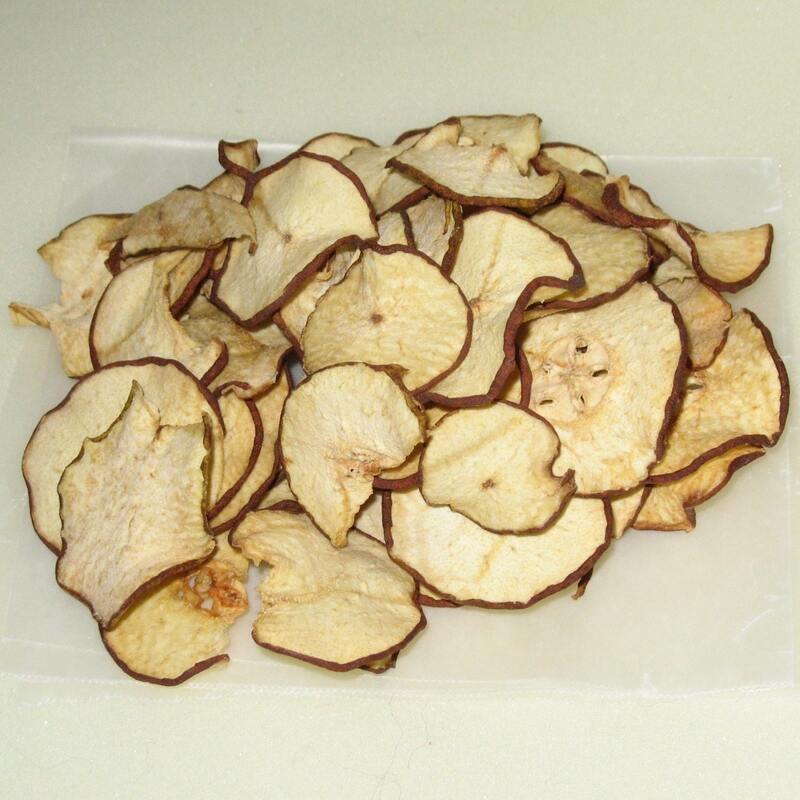 To avoid curling up or drying of the fruit, cover them with a silicone pan liner or a pizza screen. Place them in the oven. Remember to rotate pans after every 2 hours. Every fruit takes different time for cooking. For instance, banana, apple, plums and pears take about 6 hours, oranges take about 8 to 10 hours, and cranberries take nearly 12 hours. When the fruit is ready, you can remove it from the oven. Store it in a plastic or glass container. Leave this container open for next 4-5 days so that the fruit gets dried completely. Shake the container every day. After 5 days, seal the container. Your dry fruits are ready! 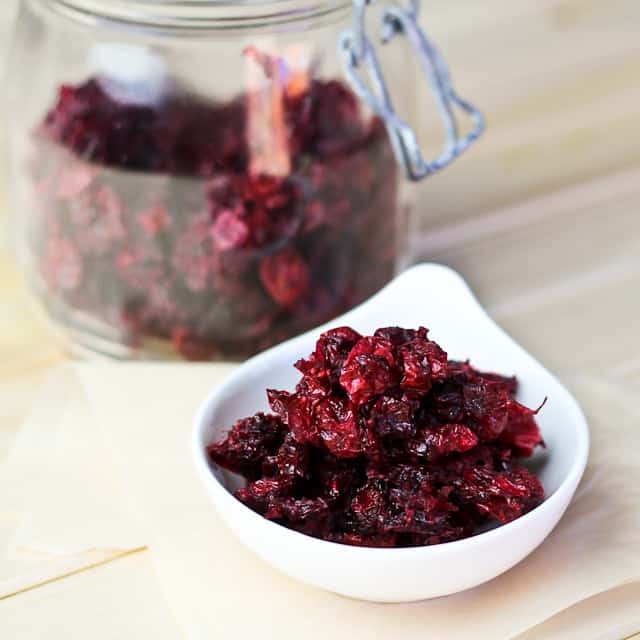 Discussed below are step by step guidelines for preparing different dry fruits at home. 1. Set your oven to preheat at 200 degrees. 2. Next, with the help of a sharp knife, thinly slice the washed apples. Chuck out the seeds. 3. Now prepare a baking sheet with a parchment paper spread over it. 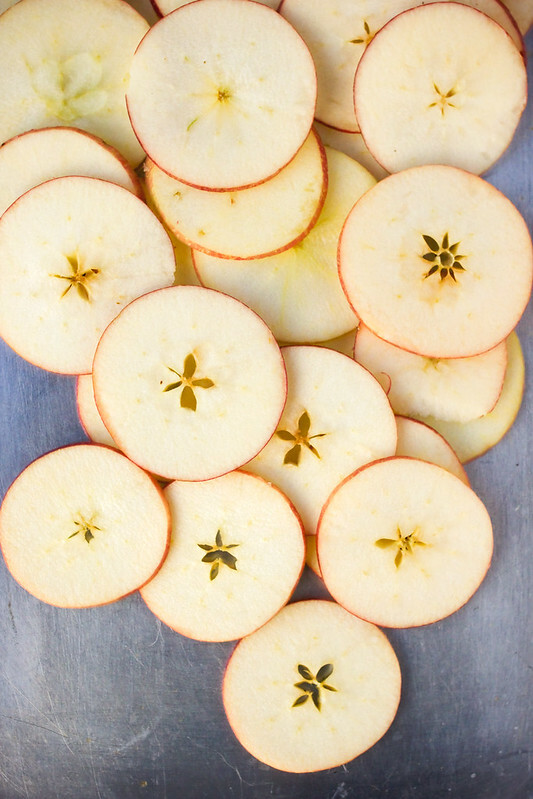 Arrange the slices of apple in a single layer without overlapping. 4. Place it in the oven and let it bake for about an hour. 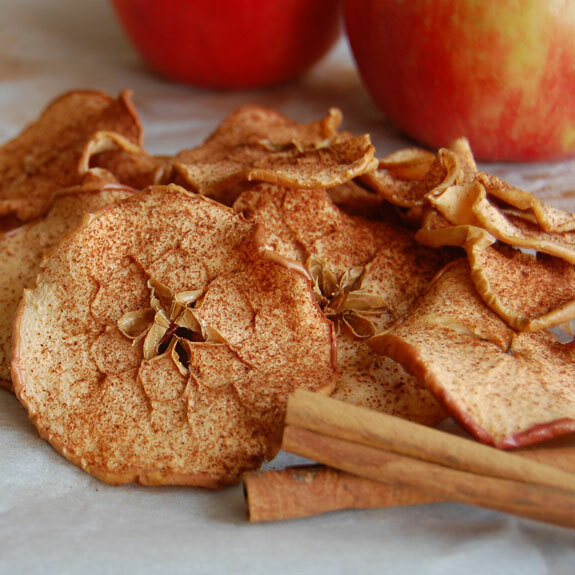 Flip and continue baking for another 1 or 2 hours till the apple slices completely lose their moisture. 5. 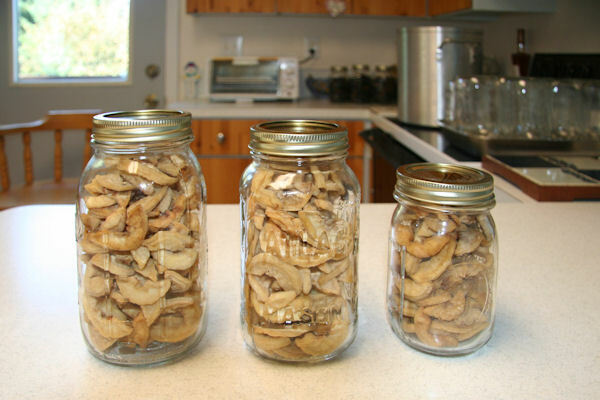 Take them out, then dry and store in an air tight container. 1. Preheat your oven at 175 degrees and use vegetable oil to grease an oven rack. 2. With the help of a sharp knife, thinly slice the washed pears. Dispose of the core. 3. 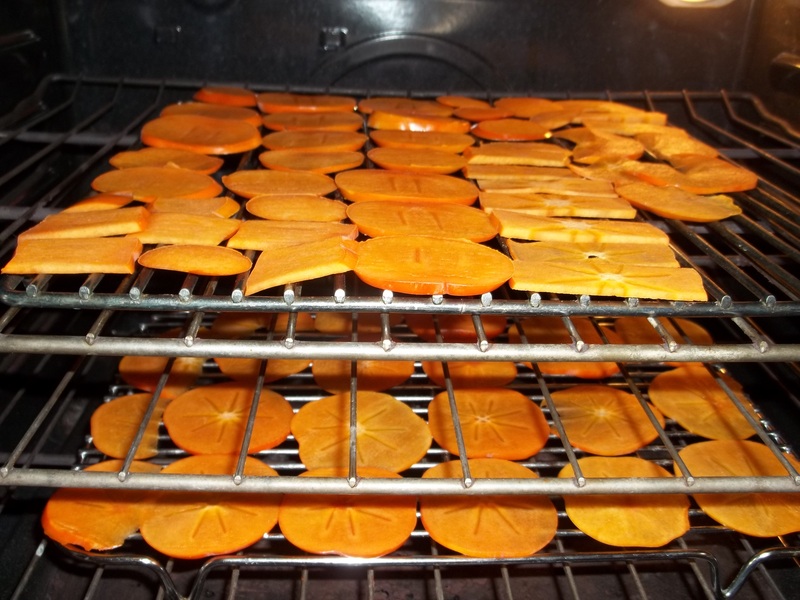 Arrange these slices in a single layer without overlapping on the prepared oven rack. 4. Let the pears bake for about 4 to 4½ hours. Halfway through it, flip the pears. Bake them till they completely dry. 5. Take them out. Let them dry and then store in a tin box at the room temperature. 1. Set your oven to preheat at 120 degrees. 2. Wash and deseed the plums. Then cut them into two even halves. 3. Place the cut plums in a single layer without overlapping, on a cookie rack and place it in the oven over rimmed baking pans. 4. Let it bake for 6 to 8 hours and, at short intervals, open the oven door to let go off the steam. 5. Now reduce the oven temperature to the lowest setting and let the plums bake for other 6 to 8 hours so that they dry completely. 6. Let them cool. Afterwards, store in an airtight container. 1. Preheat your oven at 175 degrees. 2. 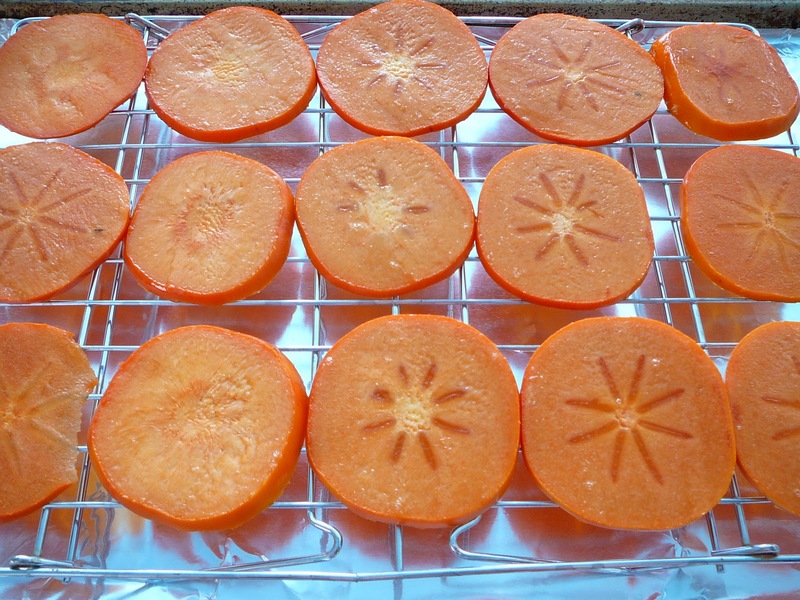 With the help of a sharp knife, cut 1 inch thick slices of washed and peeled persimmons. 3. Place the slices on a baking sheet in a single layer without overlapping and let it bake for about 8 to 10 hours. Keep flipping occasionally. 4. When the fruit is completely dehydrated, take it out and let it cool. Store it in a plastic or glass sealed container. 1. 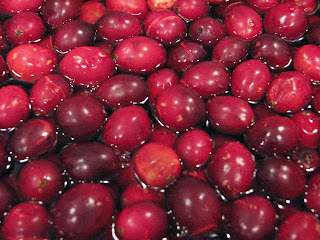 Rinse the cranberries and then submerge them in a pot of boiling water (heat must be turned off). Keep them until their skin bursts. 2. Now drain the berries. 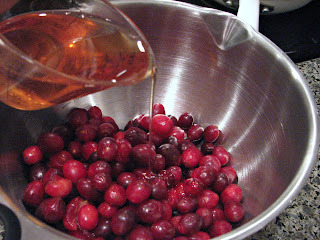 In a pan, toss the cranberries with honey. 3. Prepare a cookie sheet by lining it with a parchment paper. 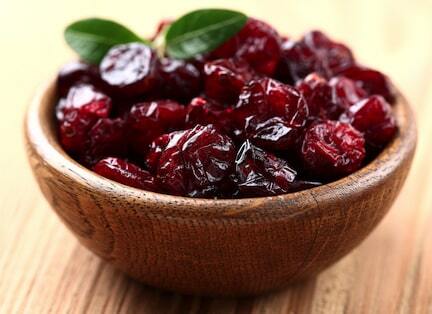 Arrange the cranberries on it in a single layer without overlapping. 4. 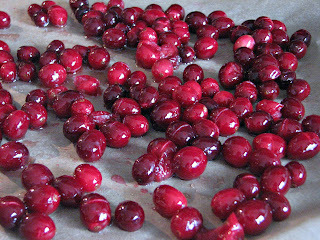 Freeze the cranberries for 2 hours. Then put them in oven at a temperature of 150 degrees. 5. Let them bake for 6 to 8 hours. 6. Take them out and store in an airtight container. 1. Let your oven preheat at 140 degrees. 2. With the help of a sharp knife, deseed and slice the oranges. 3. Blot the slices of fruit with a paper towel gently, in order to get rid of excessive moisture. 4. 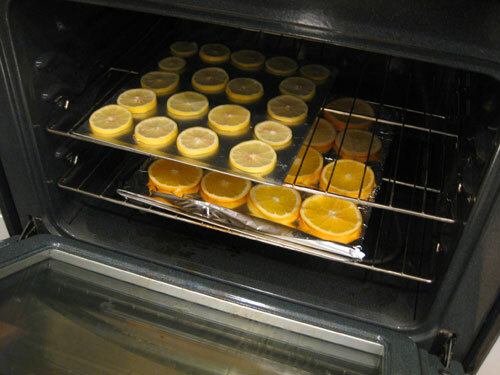 Arrange the orange slices on a baking sheet in a single layer without overlapping. Let it bake for 6 to 12 hours. Keep the oven door open by 2 to 4 inches to ensure air circulation. 5. 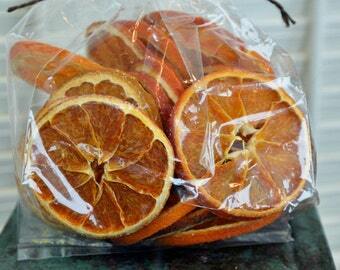 Once the slices are dehydrated, take them out and store them in a sealed plastic bag. 1. Set your oven to preheat at 50 to 90 degrees. 2. Slice peeled bananas into ¼ inch rounds or lengthwise, as per your wish. 3. 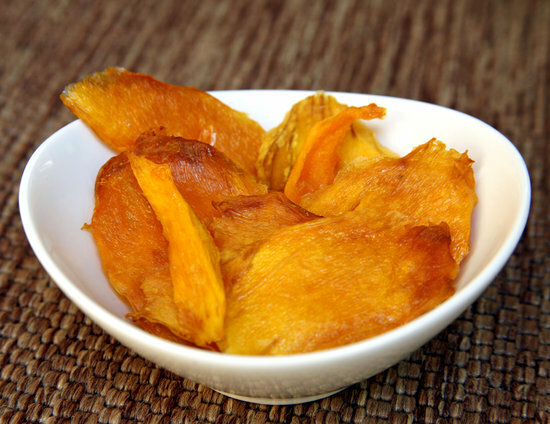 To prevent de-coloration of dried bananas, dip the pieces in diluted lemon juice for a few minutes before baking. 4. Place the banana pieces on a wire rack, with a baking pan beneath it, in a single layer without overlapping. 5. Let the bananas bake for 1 to 3 hours (in case of round chips) or 6 to 12 hours (in case of wedges). 6. Take them out, cool them and store in an airtight container. 1. Preheat the oven at 185° F. Place a silicone mat on a baking sheet and place it inside. 2. 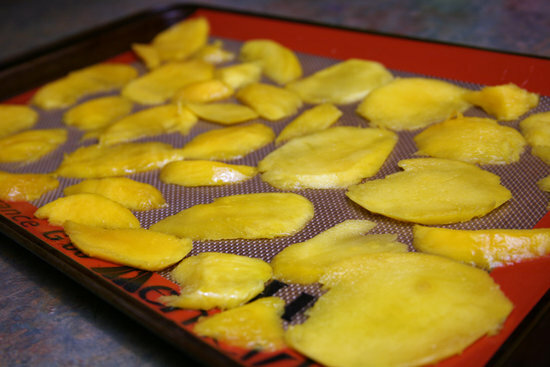 Cut thin slices of the washed and peeled mangoes. 3. Place the mango slices in a single layer but they should not overlap. Let it bake for about 2 to 3 hours with occasional flipping till the time they are completely dry. 4. Take them out, let them cool and store in an airtight container. 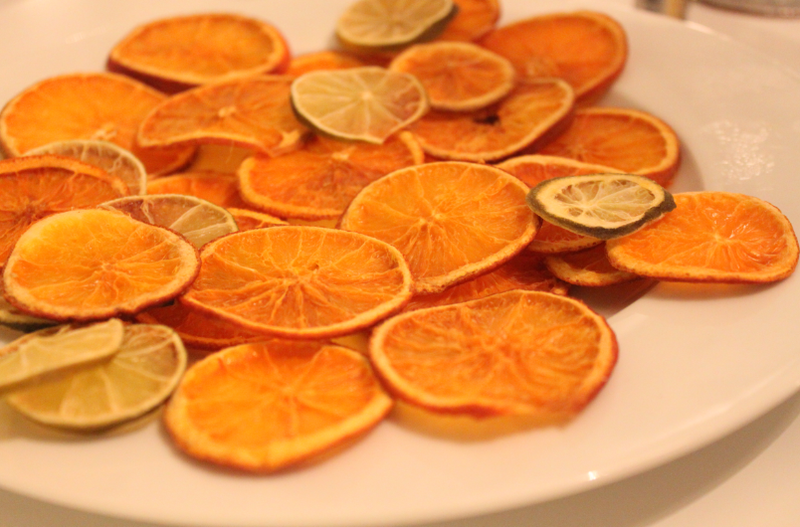 If you wish to maintain the color of fruit (non-citrus ones), it is recommended to soak them in orange or lemon juice that has been diluted with water, for a few minutes after slicing. To speed up the process, you can steam the fruit as well. The thinner you slice fruit, the lesser time it will take to dry. To keep your dry fruits in good condition and edible for a long duration, put them in properly sealed jars and store in a cool, dry and dark place.